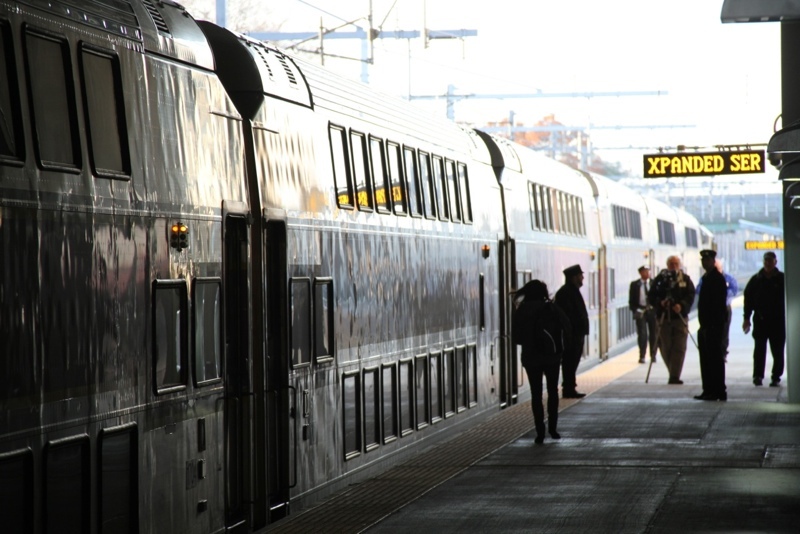 Could commuter trains someday be stopping at Pawtucket, Cranston, East Greenwich and West Davisville on their way to Kingston and Westerly and maybe into Connecticut? Could such trains link Woonsocket to Providence and T.F. Green Airport, with connections to Boston? The Rhode Island Statewide Planning Program is pondering such questions as it compiles a state rail plan for the next 20 years, to be finalized sometime this year. Oh great – so the train will be full by the time it reaches Providence and Pawtucket. But then I’m not so worried, from what I’ve seen the station at the airport and in Wickford aren’t booming. If they really want to serve those communities, all separated by about 15 miles – drop light rail tracks that stop in all the cities. Run it right down the middle of I-95 if you want. Then connect it to the commuter rail in Providence. That would have made a LOT more sense. I like the idea of light rail in the middle of I-95. It would be also good if there was light rail to Bristol county in Massachusetts in places like Swansea, seekonk, New Bedford, and Fall river. “Oh great – so the train will be full by the time it reaches Providence and Pawtucket. But then I’m not so worried, from what I’ve seen the station at the airport and in Wickford aren’t booming. No, that actually would have made a lot less sense. Spending close to (when all is said and done) $1 billion on ‘light rail’ right down the middle of I-95 is a terrible proposal to make when for a fraction of the cost (and likely the same amount of political fighting to get it done…), we could instead build out the existing rail corridor to a full four (maybe even five!) tracks between Providence and Warwick, and a full three tracks (with four where there’s room) between Warwick and the CT Line. That would be the kind of big-thinking, revolutionary change to transit in RI that this state desperately needs, because it would enable the kind of true urban shuttle service that others on this site have suggested – we could have a functioning urban commuter rail that shuttles Rhode Islanders up and down the state and denizens of the city and its surrounding towns between (re)developing urban communities built around stops placed just about a mile apart from each other. And we could do it without unduly impacting the Boston commuter market, because with three or four full tracks, we can look to Metro-North in CT and NY and adopt some of the policies and practices that they’ve gotten right – namely, a local-then-express service distribution that allows the New Haven Line to service a great many ‘small towns’ equivalent to an East Greenwich or a Westerly in the heart of CT while still maintaining an overall trip time between New Haven and New York that, while not stellar, is miles ahead of where the MBTA/MBCR is today. Providence could be and should be the Boston commuter rail market’s equivalent of Stamford – the point where these local RI-service-oriented trains that RI is paying for transition into being express trains to Boston, passing through every stop before either Ruggles or Back Bay at full speed. All the stops that the RI express train passes through will continue to be served by the MBTA’s trains – which would no longer travel south of the Airport and most of which would go back to terminating at Providence, as it should be. It works for Metro-North, it will work for us as well. THAT would make far more sense than the current plan, which seems to be just tacking on stops and adding time to the trip with no care or thought given to express service patterns or cutting the line up in such a way to maximize both speed of travel as well as frequency. The closest we’ve gotten is a couple of MBTA round-trips daily that run express between Mansfield and Boston, and a couple of ‘reverse peak’ round trips that the MBTA operates between Wickford Junction and Providence at the precise times that nobody is likely to be making that trip. It would also make far more sense than spending $1 billion on an (expensive, messy) overhaul of I-95 to permit adding light rail tracks, because all the places there’s room for tracks on I-95 right now are the exact same places where extending commuter rail is treated as a giveaway to the suburbs and a horrible thing. In fact, there are places in the state where spending that kind of money on a brand-new rail corridor makes far more sense, if we want the conversation to be all about new lines instead of improving the lines we have today. You want to commit to a lengthy political battle and spending a huge amount of money to add rail service to places that haven’t had it for decades? Focus on the Washington Secondary Trail, which is a mediocre bike path today but potentially a fabulous light rail line running between downtown Providence and the Warwick Mall in 2025, and maybe as far out as Coventry in 2035. You want to try and rectify what is perhaps the biggest mistake that RI and CT have been making together for at least 50 years and probably closer to 100? Fight, fight, fight for intercity rail between Providence and Hartford. You want downtown Providence to kick off a nation-wide wave of restoring and replacing the great many streetcar lines that were taken from us so long ago? Forget the ‘Core Connector’ and get behind a plan to spend $1 billion on streetcars running from Olneyville to Fox Point and Cranston to Pawtucket instead. Even if the idea is that by forcing a reconfiguration of I-95 to support transit, we can curb the highway’s impact on the city, Route 10 is a far better target for reduction/elimination and the fight to tear that road down is one that we’re far more likely to win. There’s no good reason to pursue light rail along I-95 and plenty of good reasons to direct the money and political capital elsewhere. The red state of Utah is a good example of how this kind of commuter and light-rail development could be done in Rhode Island. Metro Salt Lake City has a disadvantage of being more uniformly spread out and less densely populated that the Providence area, however the region by population is similar in size to the Providence metro. Utah has developed one of the most robust rail mass transit systems in the country and has probably the largest system for a small city. They started in 1999 and currently are way ahead in the timeline for constructing their system and because they accelerated their construction plans have spent considerably less than original projections. Get Amtrak or the MBTA to run express trains between Providence and Boston and those Downtown/College Hill homes would fill up quickly and the Downtown economy would boom. Concentrist– the Amtrak is already 42mins to Boston. That’s nothing. Look at commute times on the Long Island Rail Road into Manhattan. 42mins is the same as the express train from the suburb I grew up in and those trains were filled to the brim every morning. For what it’s worth, Downcity and College Hill homes are full. So I’m not sure why you think that’s the issue.